As a kid growing up on a farm in eastern North Carolina, I built many treehouses. 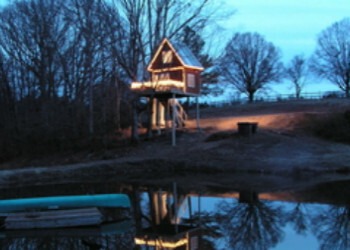 In the spring of 1999, I decided it as time to build a treehouse for adults - for my wife, Dianne, and me. This treehousee sits 30 feet in the air and the lower level as a treehouse for our daughter when she was little. Since that time, we have received a lot of attention from newapapers and national magazines about our treehousee. It is equipped with a double bed, ceiling fan, couch, an outdoor fireplace, phone (we don't always answer it), rocking chairs, and much more. 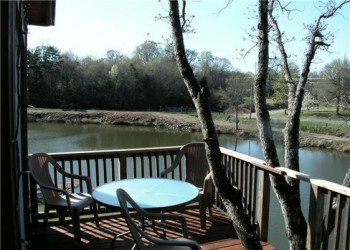 The two porches allow breathtaking view of the vineyards, our pond, and our horses. In 2004, we decided that it was time to plant a vineyard in Monroe, NC. This was the beginning of Treehouse Vineyards. We planted our first vines in the spring of 2005. Since that time, we have planted eight varieties of Muscadines. Among our different varieties at Treehouse Vineyards, one came directly from "The Mother Vine" in Manteo, NC. This vine is historically documented to have existed in 1584 and is the oldest cultivated vine in America. In 1584, the first expedition led by Amadas and Barlowe explored the Carolina Outer Banks. In their report to Sir Walter Raleigh, they noted that the land was .... so full of grapes as the very beating and surge of the sea overflowed them. Before planting in the spring of 2005, we had to prepare the vineyard. The first task was to get soil samples and prepare the soil. A good muscadine vineyard should have a PH of about 6.5 - 6.8. Next, we installed the vine trellis system that holds the vines. The vines are 15 feet apart and the rows are 11 feet apart. This gives each vine plenty of sunshine, which is very important for the growth and quality of the grapes. The quantity of grapes is not the most important factor - it's the quality that is most important. Too many grapes can affect the acid and sugar content which is very, very important. In the spring of 2005, we planted 50 vines of two varieties, Carlos and Noble. These two varieties of muscadines are the most common in the muscadine wine industry in North Carolina. Both varieties were developed at North Carolina State University in Raleigh, NC. These plants were about two feet tall when planted. After five years of hard work, we are ready to open for business. Our first official day of business will be November 20. 2010. Come join us and enjoy the fruits of our labor, "You will be glad you did"!